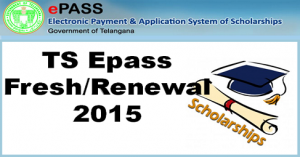 Telangana Epass Postmatric Scholarships (Fresh/Renewal) 2015-16: Government of Telangana offers post matric Scholarship / fees reimbursement to the students of State for enabling eligible students who have passed tenth class (SSC examination or equivalent) to pursue post matric studies such as Intermediate, polytechnic, Professional courses, ITI, Graduation, Post Graduate, Ph.D courses etc. The eligibility for the candidates to apply for scholarship is that the candidate should belong to the families whose income is below 1 Lakh rupees. 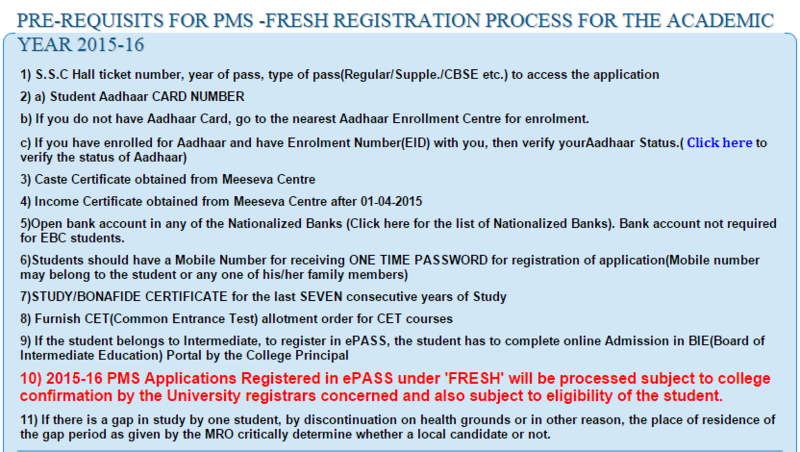 The fresh registrations, as well as renewal registrations for Telangana Epass Postmatric Scholarships for the academic year 2015-2016, had opened and hence, all the students studying PG courses (who are eligible for fresh & renewal scholarships / reimbursement of tuition fee for the academic year 2015-16), are required to apply on-line before the last date ( 30th October, 2015) for fresh / renewal scholarships. Keeping in view, the problems of lower middle and lower classes of General category candidates, Government has provided the scholarships in the name of Economical Backward Caste (EBC). So candidates belonging to different categories like BC, SC, ST will get full fees waiver and for EBC it is up to 35,000 whatever might be the college fees. All the students must have a bank account in any of the nationalized scheduled banks to get scholarship. The fresh registrations as well as renewal registrations for Telangana Epass Postmatric Scholarships for the academic year 2015 to 2016 had opened now. All the eligible students who are going to apply for Telangana Epass Scholarships (Fresh/Renewal) documents for the Academic Year 2015-16 need to have the following scanned. Online registration for the academic year 2015-16 is kept open from 16/9/2015. During the application process you may require the following details. So please check them before applying. Go to the official website of Telangana epass i.e., telanganaepass.cgg.gov.in or click on the direct link provided below to fill the TS Epass Fresh Applications form 2015-16. Those students who had already applied for fresh applications last year have to apply for TS epass Renewal applications. The renewal application is very simple than fresh application. Upload scanned copies of Bank Pass Book, Latest Marks memo, and Original Income Affidavit. 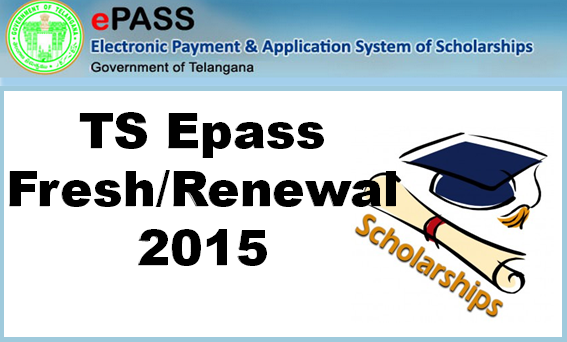 Stay tuned with us for more updates on TS Epass Scholarships-Fresh, Renewal applications, Telangana Epass Scholarship Status, etc Press CTRL+D right now to bookmark this page.